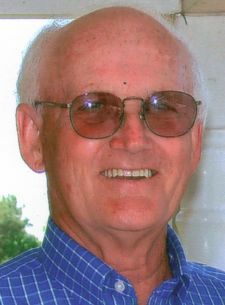 Clarence Jackson "Jackie" Joyce age 82 of 1972 Paw Paw Road, Stoneville passed away on Monday April 15, 2019 at his home. A funeral service will be held 2 pm Thursday at Stoneville Pentecostal Holiness Church in Stoneville with burial to follow at Matthews Chapel United Methodist Church Cemetery, on Smith Road in Stoneville with Military Honors provided by Rockingham County Veterans Honor Guard and the US Navy. The family will receive friends on Wednesday evening from 6 - 8 pm at Stoneville Pentecostal Holiness Church. Jackie was born June 22, 1936 in Sandy Ridge, NC to the late Clarence Luther Joyce and Mae Martin Joyce. He was a US Navy Veteran. Jackie was the former Lay Speaker at Matthews Chapel and was presently the Elder of Visitation Care Ministry at Stoneville Pentecostal Holiness Church. Preceding him in death along with his parents was sisters, Irene Heaton and Minnie Lee Williams. Surviving are wife, Elizabeth Gray Joyce of the home; daughter, Miranda Knight and husband Kevin of Madison; son Terry Joyce and wife Kim of Fayetteville, NC; grandchildren, Kameron Knight, Kenlon Knight and Kramer Joyce; great grandchildren, Dallas, Karter, Kyler and Karli Knight; brother, Johnny Joyce and wife Hazel of Madison; sisters Peggy Glave of Nashville, TN, Geraldine Johnson and husband Gene of Madison and Teresa Manuel of Mayodan; special nephews, Charles "Greg" Smith and Marty White. Memorials to: St. Judes Childrens Hospital, 501 Street Jude Place, Memphis, TN 38105. Dear Joyce Family. I am so sorry for your loss, may you find comfort in the words recorded in John 5:28,29 where Jehovah God through his son Jesus Christ promises to bring back our dead loved ones! Then people everywhere will be able to live as Jehovah God purposed for them to live ——- forever in perfect health. Hope this brought you comfort, for more please visit JW.org. Dear Joyce family, Linda and I are so sorry for your loss. Sending prayers that you find comfort in the many god memories you have of him as a loving husnabd, father and grandfather. Elizabeth and family, so sorry to hear this. Jackie was a sweet man and was always kind whenever I saw him and I know that may mama absolutely loved him! Prayers for you in the coming days ahead.